Refrigerated pasteurized milk typically lasts about two to three weeks before turning into a wretched hive of scum and villainy. A new process developed by researchers at Purdue University extends the shelf life of milk up to 63 days—and without the benefit of added chemicals. Purdue University researcher Bruce Applegate, along with pals from the University of Tennessee, accomplished the feat by increasing the temperature of milk by 10 degrees for less than a second. The process, described in the latest issue of SpringerPlus, eliminated more than 99 percent of the bacteria left behind after initial pasteurization. 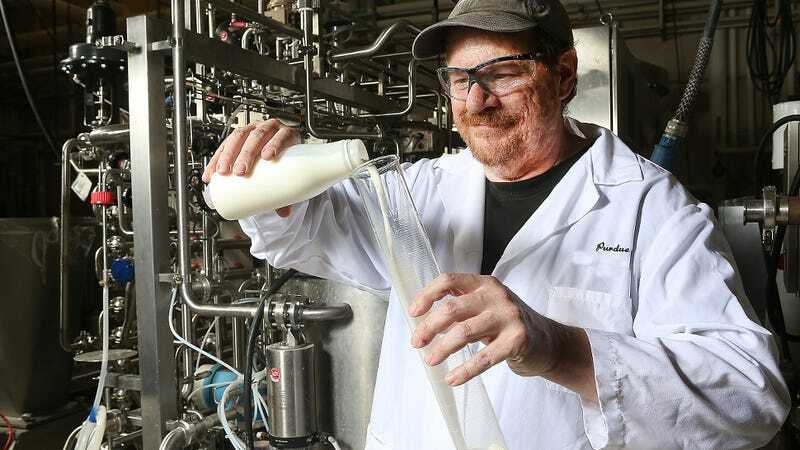 “It’s an add-on to pasteurization, but it can add shelf life of up to five, six or seven weeks to cold milk,” noted Applegate in a press release. Milk that comes from cows is normally packed with microorganisms. To make it safe for human consumption, milk is pasteurized to remove significant amounts of harmful pathogens that can make us sick and eventually turn our favorite dairy beverage into a sour glop of uselessness. Developed by Louis Pasteur in the 19th century, the technique kills most of the bacteria, so commercially processed milk contains basically no microorganisms. The new process destroys most of the trace amounts of bacteria left over by this tried-and-true treatment, dramatically extending milk’s expiration date. Here’s how the low-temperature, short-time (LTST) method works: Tiny droplets of already-pasteurized milk are placed into a heated, pressurized chamber that rapidly raises and lowers the temperature of the milk about 10 degrees Celsius, but still below the 70-degree Celsius threshold required for pasteurization. After treatment, milk that was pre-loaded with Lactobacillus and Pseudomonas showed bacterial levels below detection limits. Follow-up tests found no discernible differences between regular pasteurized milk and milk treated with LTST. Importantly, panelists weren’t able to detect any differences in color, aroma, taste, or aftertaste between the two versions. The researchers admit that the technique isn’t perfect—they’re still dealing with some minor contamination issues—but they say their initial experiments show promise as something that can be ramped up to an industrial scale. A neat part about this method is that it already uses the heat required to pasteurize milk, so extra energy isn’t required to run the system. The LTST chamber was developed by Millisecond Technologies from New York, and a US patent has already been awarded. This company and the researchers who developed the method stand to profit from this breakthrough, but it could also go a long way in reducing food waste. This is brilliant, but there’s still no word on when super milk might find its way to your grocery store.